Highway Hawk Fat Wishbone Stuur (Honda) is toegevoegd aan uw winkelwagen. 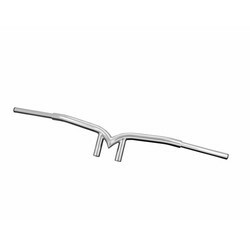 Highway Hawk Fat Wishbone Stuur Ø32mm (1 1/4") in Chrome (M12 mounting) TÜV approved. A - 22 cm B - 13 cm C - 96 cm Made of High Quality Chromed Steel.